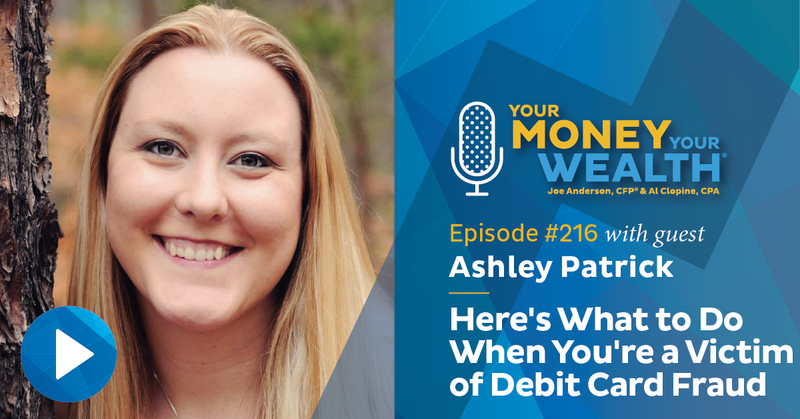 Ashley Patrick (former police detective and creator of BudgetsMadeEasy.com) explains how debit card fraud happens, what to do when your ATM card is compromised, and ways to avoid it happening in the future. Plus, Joe and Big Al answer your money questions: how do you determine a good pre-tax to Roth savings ratio? Are trading apps and online trading services a good idea? Can you “retire,” take money from your retirement plan, then return to work for the same company? And the age-old pension question: should you take the lump sum or the monthly annuity payment? (10:35) Is There a Strategy for Determining Your Pre-Tax to Roth Savings Ratio? (16:56) Can I “Retire,” Take Money From My 457 Plan, Then Return to Work for the Same Company? (21:54) Are Trading Apps and Online Trading Services a Good Idea? (34:23) What’s a Good Tax-Efficient Mutual Fund to Hold in a Taxable Account? (35:11) Should I Open a Roth IRA and Invest in a Target Date Fund for My Kids’ Future? Today on Your Money, Your Wealth, Joe Anderson, CFP® and Big Al Clopine, CPA talk about the strategy to determine how much to save to your pre-tax accounts vs your Roth, whether or not to use trading apps and online trading services, whether to take the lump sum or the monthly annuity payment from your pension, and much more. But for the moment, I’ve asked the fellas to give me a little time to tell a story. I’m producer Andi Last, and Friday the 29th of March was payday, the following Monday, the rent was due, and on the weekend in between, I got robbed. Andi: On Sunday I went to Grant Sabatier’s San Diego meet up for his book, Financial Freedom, and then I tried to get money from my ATM and it said my withdrawal limit was reached – and I hadn’t used my debit card in six weeks! I found out that money had been withdrawn from a local ATM the day before, on Saturday, two hours after my bank closed for the weekend. And then another bunch of money was taken out the next day, Sunday, while I was at the meet up. So I was able to freeze the bank card through the bank’s website, but I couldn’t use my debit card or even report the theft until the bank opened 9 am on Monday. So, debit card fraud: it is something that happens regardless of where you bank, regardless of how much money you have in your account – and I knew nothing about it, so I decided it was time to contact somebody who could tell us a little bit about it. So our guest is Ashley Patrick. She’s the founder of BudgetsMadeEasy.com, helping families eliminate debt using simple strategies so they can stress less and live the life they want. But before she started BudgetsMadeEasy.com, Ashley was a police detective for 10 years in North Carolina and helped victims of financial crimes, like this one, sexual assault, and domestic violence. Ashley, welcome to the show, how are you? Ashley: Hi, thanks for having me. Andi: Absolutely. Thank you for joining us. And now, according to FICO, the rate of debit card fraud has almost doubled every year over the last three years. And since that makes budgeting hard, hopefully you can explain to us how ATM fraud happens, what to do when it does, and how to avoid it happening in the future. So let me ask you, first of all, how did the thieves get and use my debit card and my PIN number without having the actual card? Ashley: A lot of times they put skimmers onto gas station pumps and they will actually have, in ATMs, it happens quite frequently actually, and they’ve gotten really sophisticated, so they actually have like a little pinhole camera there to see your PIN number as well. So it looks exactly like it’s supposed to look. Some of the things I do whenever I go to the gas pumps is I’ll just kind of shake the card reader a little bit if it’s loose. So that’s one thing that I do, and then I’ll just kind of quickly scan, make sure if there is tape on it that it isn’t broken or anything like that. So it looks just like the card reader, they put it in there really fast, and they don’t get caught very often and it’s very sophisticated. So what they do is they get your information and your pin number and they make a new card with their information on it, or a fake I.D. that they have matching the card if they need it, and they actually have it where it’s Bluetooth now, so in order to get the information from the skimmer they can just pull into the parking lot and just connect to the Bluetooth and download all the card information – so they just travel around and do this all the time. So like you said, it could have been six weeks ago and they just went through wherever you used it, possibly the gas station, and downloaded the information and made a new card. Andi: And so it’s not necessarily just my card, it could be everybody that used that ATM or that gas pump that day. Andi: (laughs) So now wait a minute you’re a police detective, you’re supposed to know better how to keep this from happening! Andi: I think I read that it’s actually better to use your credit card for making purchases than to use a debit card because there are better consumer protections in place for credit cards. If you’re using a debit card, the money is coming directly out of your bank account. Ashley: Right. The legal protections are supposed to be the same, it’s supposed to be the same as swiping your card, but you’re out the money in your account, and I don’t want to deal with that, so I’d rather be able to let the credit card company handle it, and I can just shut the card off and go on with my life and wait for a new card, as opposed to having my account locked down and having to deal with all that. It’s such a hassle, so you know, I do keep a credit card for online stuff, and that helps a lot whenever it does happen, because honestly, it’s going to keep happening and it’s going to happen to probably everybody. (laughs) There’s not a lot you could do. Ashley: Right. Yes, absolutely. So what you do is call your bank, which I’m surprised they didn’t let you do it 24 hours, report it 24 hours – so call your bank and shut the card off immediately and then they’ll send you a new card, and then with identity theft you report it to your local agency, wherever you live, report it to them. But you also can report it to wherever it was used. So if it was used across the country, in another jurisdiction, you have to dig and find out who to contact there, so that’s kind of a hassle – and a lot of times, honestly, they get so many of these, it’s like, “well, how am I going to ever figure out who it was?” Especially when it’s across the country. So it usually gets closed until somebody gets caught and then they’ll try and figure it out. Andi: I was lucky enough that even though my bank was closed for the weekend, on their mobile app and on the website, they have a card control feature. So I was able to freeze the card on the website until I was able to go in on Monday morning, and obviously I disputed the transactions, the the money being withdrawn from my ATM, and I was able to get a new debit card immediately. So that was great. And I’m actually still waiting for the fraud department to call me to talk about the transactions and all of that, but in the meantime, they’ve issued me a provisional credit. So I was able to pay the rent. So that’s really good! I was glad about that! So now in future, what do I need to do differently to make sure – or to prevent. I guess you can’t make sure, but how do you do your best to prevent this kind of thing happening? I mean one thing that I heard is don’t pay at the pump – go in. Go inside the store, or go inside the gas station and pay with the actual person there. Ashley: You can, but that’s kind of a hassle. You know I’ve got three small kids and I’m not taking them all into the gas station to get gas every time, no thank you. So you know, you can use a credit card, just in case, that way it’s not so much of a hassle if it does get stolen. I know some people use gift cards, reloadable gift cards, I’ve never done that but I’ve heard people that do that, and then it kind of helps you stay in your budget as well because you’ve only got so much on the gift card. And then if that gets stolen you can just get another gift card. So those are a couple of things. You know, just monitor your bank account for when it happens. You can dispute it right away and get help so that your stuff doesn’t get overdrawn and things like that. Andi: That is one thing that the bank did tell me when I finally got in touch with them, was they said to sign up for card alerts or transaction alerts on your account, so that you’re notified as soon as something happens. Because like in this case, this was a debit card, so I never use my debit card except in rare instances. So if I had gotten pinged the day before, “hey, there was just a transaction on your account,” I would have known that much sooner. So that’s another thing that was suggested by the bank and then yes, now I’m just checking my bank balances daily to find out, to make sure that no money has left that I am not responsible for. (laughs) And then the other thing that I heard is don’t carry cards that you don’t use regularly. Isn’t there’s something called RFID? I’m not even sure what that is, but they can scan it through your wallet or your purse? Ashley: Yeah, they can. They have these little scanners that they can just walk around and it gets your card information. See, the problem is like, what, two years ago or so, all the new cards have the chip and you have to put in the chip reader instead of sliding it. It’s supposed to help with that, but the problem is that, at least in America, we still have both. We still have these slide, where in other countries they just have the chip – some other countries – so I think once we make the transition over to just the chip, that will help with that. But criminals are smart, and they adapt, and they’ll just find a new way to do it. Andi: Yeah. So these are just some of the tips, some of the ways that you can help combat debit card fraud and to know what to do when it happens to you. And we should mention Ashley Patrick at BudgetsMadeEasy.com – she helps families eliminate debt using simple strategies so that they can stress less and live the life they want. And this comes from personal experience for you doesn’t it? What is it? You paid off $45,000 in debt in 17 months? Andi: Fantastic. And you were able to quit your stressful day job after paying that debt and now you’re helping other people to be able to pay off debt, right? Ashley: Yes. My friends and coworkers, they saw what I was able to do and how fast I was able to pay it off, and they started asking me how to do it. And so I just helped more and more people and it grew into a business. And so now I help other people do the same thing. Andi: BudgetsMadeEasy.com. Ashley Patrick has got a free Seven Day Budget Makeover Course and a Budget Planner there on the website, you can check them out in the show notes at YourMoneyYourWealth.com as well. And thank you, both for your debt resolution experience, and as well as your police detective experience in helping us discuss this issue of debit card fraud. We really appreciate it. Now let’s get to your money questions. If you’ve got one, go to YourMoneyYourWealth.com, scroll down to the Ask Joe and Al On Air button and send your question to the fellas as a voice recording or an email. They’ll answer it on the show, we’ll send you a free copy of Larry Swedroe’s book, Think, Act and Invest Like Warren Buffett, and we may even send you a video of their answer. Here they are now, Joe Anderson, CFP® and Big Al Clopine, CPA. 10:35 – Is There a Strategy for Determining Your Pre-Tax to Roth Savings Ratio? Joe: There are some people that are really looking to get a full financial plan from the email bag. Al: (laughs) Are you gonna read all this stuff? Joe: I am going to read the 16 pages that David from Denver sent me. Joe: No he has a short one. Thank you David. “Hello. I love the podcast with Joe and Big Al. I’m 37 year old tech professional and I really enjoy the Roth IRA topics lately. I am blessed to work for a company that offers both 401(k) and a 457 plan. Recently, the 457 was opened up to accept Roth contributions. My personal strategy has been to contribute to the 401(k) and take advantage of the company match and put all additional contributions, next, to the Roth 457. My question for you is, have you recommended a pre-tax to Roth ratio or strategy?” So what he’s looking for Al, is do we have a strategy in mind or have recommended a strategy to figure out what the appropriate ratio of pre-tax to Roth is. David, thank you for the telephone call. Or I guess email. Andi: That was an email. Joe: He didn’t call us because I would have heared his voice. Andi: Yes, you would have “heared” him. Al: (laughs) You would’ve heard it. You wouldn’t have “heared” it. Al: (laughs) I’m just thinking…. Andi: At least somebody is. Al: …that would be the proper way to say that. (laughs) Do you “heared” a lot of stuff? Joe: (laughs) Yes I do, sometimes. Oh boy. What’s the ratio, Al? What’s the pre-tax to Roth ratio? Al: That’s a good question David, it’s a very good question. It’s a very difficult one to ask because everyone’s situation is different. Al: Oh thank you. We’re correcting each other on this. Yeah very difficult to answer because everyone’s situation is different, but if I had to give a generality, I would start with the fact that you want to make sure you invest in your 401(k) to the match. So bravo, you’ve got that right. And then Joe, sometimes we will sa,y, then if you can do a Roth contribution, which for 2019 is $6,000 ($7,000 if you’re 50 and older), go ahead and do that next. And then come back to your 401(k) and start putting the rest in there. Now in this case, it’s a little bit more complicated because there’s a 457 that has a Roth option. So if you take that same logic, then you could say yeah, contribute to the 401(k) match first and then go to the 457 and max out the Roth completel,y and then go back to your 401(k). I’m assuming the 401(k) does not have a Roth option, which is why you’re flipping to the 457 – I’m making that assumption. And I think that would be, generally, a good statement. And of course, at 37 years of age, your income is more than a 20 year old’s, so you’re probably in a little bit higher tax bracket. That what I just told you would be kind of a no-brainer for a 20 year old. As you get older it gets a little trickier, because you may be in a high enough tax bracket where that may not be the best advice. Joe: Yeah. I like what David’s doing here, and I agree with just about everything you said Al. 37, tech professional. He’s got a 401(k), 457. The 457 plan, for those of you that are not familiar with the 457 plan, is a non-qualified plan. So he can take money out of that plan at any age. There’s no 10% penalties there. So I like that aspect of it if he jams that thing up in Roth dollars. And then if he wants retire a little early he has access to that. So yeah. There is no specific ratio though. What the math is behind some of the things that we do here at the office is we try to figure out what the ratio needs to be for that individual to keep that individual in the lowest tax bracket possible when it comes time for distributions. So you have to re-engineer all of this stuff versus saying, “Hey dude, 30 percent in pre-tax,70 percent after tax,” or whatever. Right? “Given your tax bracket, here’s your ratio.” How how you want to look at this is say, “All right well, if I’m 37 and I want to retire at 67, I have 30 years.” And then I look out 30 years and say, “I’m spending $80,000 today.” Inflate the $80,000 throughout inflation for 30 years. Now that $80,000 is $160,000, and so you need to figure out an income strategy to create $160,000 of income. But then you’ll have Social Security, maybe you have pensions, maybe you have whatever. And then what is your shortfall going to be? That is the demand from the overall portfolio. So that’s how we do planning, is kind of forecast out to take a look at where they’re going to look at and then come back to today to say, “well, this is how much money that they should have in Roth, this is how much money that they should have in retirement accounts,” because you still want to take advantage of retirement accounts because you can still funnel money out of there at a zero percent bracket, a 10 percent bracket, 12 or 15, which are fairly low, so you still absolutely want to take advantage of the pre-tax component of the 401(k), take advantage of the match. But like you said Al, it really depends on his tax bracket to even go more into the 401(k) or pre-tax to figure out what that ratio should look like. Al: Yeah. And something else would be with a tech company, sometimes you have stock options. And when you exercise those options, mostly they’re non-qualified options, which means whatever the grant price is versus the current price is considered income – taxable income right on your W-2, basically treated as compensation. So if you’re in a year where you have a lot of stock options and it pushes you into a high bracket, maybe the highest of brackets, maybe that’s the year that you do not put any money into a Roth, you take that tax deduction. But a more regular year when you don’t have stock option exercises and you’re in a low enough bracket? Then I would definitely do as much Roth as you possibly could. 16:56 – Can I “Retire,” Take Money From My 457 Plan, Then Return to Work for the Same Company? Joe: We’ve got Kevin from Texas. “Hi, I’m a big fan of the show. I love learning about Roth IRAs and I feel inspired when I listen to you. Here is my financial situation. I will turn 33 in July, wife 31. We have $132,000 in Roth IRAs.” Boom. Good job. “$132,000 in Roth IRAs, 403(b), 457 plans and some taxable accounts, and $22,000 in emergency fund.” All right. So he’s got $150,000 saved. “My 457 plan currently has $23,000, it was maxed out last year and I’m planning to do the same thing in 2019 and 2020. We are planning to take a sabbatical in August 2021 to June 2022. I was born in the Dominican Republic. My daughter will be 3 years old in 2021, so we plan to enroll her in a bilingual private school in the Dominican Republic and spend some time with her. We’ll need about $20,000 for the entire year because the cost of living is very low. Additionally, we will be staying at my parents house so we won’t have to pay rent. I will also do some online tutoring from overseas. I am a schoolteacher and my district guarantees my salary if I return to the district within 3 years. My current salary is around $80,000 and it might go up to $90,000 starting in August. We get paid per performance at the school district.” So he must be killing it. Al: Must be – good job. Joe: “If I leave the district for a year, I withdraw $20,000 from my 457 to pay for my year expenses, (I know that you can withdraw money from a 457 plan once you leave your job), my question is, is it possible to “retire,” take money from the 457, and then return to work? Once I return can I start contributing to my 457 plan again? Can I return to the same employer? I’ve done a lot of research online and can’t find an answer to this question. I appreciate your help.” Allrighty. I’ve got a few things on this, Al. Al: Yeah, well you’re our 457 expert so you take it. Joe: Okay. First of all Kevin, I think what you’re doing is fantastic. A sabbatical for a year to go down to the DR, hang out with your three year old chill for a year. That sounds pretty cool, huh? Joe: (laughs) That’s called retirement, Alan. Joe: Yes. All right. So 457 plans, yes. I don’t know – here are the rules when it comes to these stupid plans, 401(k) plans, 403(b), 457s and everything else. There is a here’s what the IRS states, and then there’s a plan document. And the plan document will supersede what the IRS dates. Whatever is more stringent is actually the law. 457 plans, if I separate from service, I can take money from the 457 plan, spend the money, there is no 10 percent penalty. In some 457 plans, you don’t need even to be separated from service to take distributions from the 457 plan. So it depends upon the plan. I’m guessing that if he separates from service – but he’s taking a sabbatical, so he’s still technically on the payroll. He’s just not getting paid. And then he’s gonna go back to that same employer and then say, “I’m now back to work, I’m going to enroll, I’m going to continue to save into the plan.” Here’s what my guess is, Kevin: I’m gonna say yeah, you’re gonna have access to the money. Take it out, spend it, and yes, you’ll still be able to enroll. I will ask you this though, if you could email me your school district and then I’ll find out for sure for you. Al: So, okay. I’m gonna say this. I’m going to say those plans that you have, the Roth IRAs, the 403(b)s, the 457s, they’re designed for retirement, not necessarily sabbaticals. It sounds like you’re making good money and you’re able to save, and you’re not going to do this till August of 2021. I would just come up with a savings plan to save an extra $20,000. Joe: Yeah, why even go down the path of putting in the 457 plan in the first place? Al: Yeah, you’ve got two years. Joe: He maxed it out, he said, and he plans to do it for the next two years? Don’t do it. Al: Yeah. Maybe don’t max it out. Joe: Put it into a savings account. Al: That’s what I would do, and try to keep your emergency savings. I think that’s a good idea. But it sounds like you have enough income and discipline to be able to cashflow this, just by saving over the next couple of years. So that’s my thought. Joe: Yeah. No, I like your thought a lot better than my guess. (laughs) I’m just throwing stuff at the wall. But yeah, I think that is more appropriate. 21:54 – Are Trading Apps and Online Trading Services a Good Idea? Al: Wow, that’s quite, that’s – thank you Jonathan. That’s nice. Joe: Jonathan. You need to branch out a little bit, bro. There are a lot of really good podcasts out there. What’s your favorite podcast, Al? Al: No. I’ve actually been listening to more books on tape lately. What would be my favorite podcast at the moment? I just heard one. It’s about earthquakes. It’s called The Big One. That one is pretty good. Joe: It’s a podcast on earthquakes? Oh my God. (laughs) Why don’t you go hang out with Jonathan? Al: You hear the Richter scale going (Al makes sound effects, laughs). It’s exciting. Actually it was pretty good, I’m telling you. Joe: OK. So Jonathan, back to him, San Diego. He’s a 37 year old, “just started a new family and I am all of a sudden very concerned with the future of my family and the ability to provide at the end of my career and into retirement. I’m a paramedic in the city of San Diego.” Awesome. Thank you for your service. “I make about $52k per year, my wife pulls in about 15 working part time. We have about $16K of debt and we’re currently renters. And all debt would be in school or car loans. Our debt is now being properly managed and I have a 401(k) established through my employer. I recently created a high yield savings account with an online bank and am looking into a Roth. I am now wanting to create means of secondary income for my future and I have been considering index fund and ETF investments. In regard to stock trading programs and phone applications, (Robinhood, Stash, etc. ), do you fellas feel that they are appropriate for someone to establish some sort of experience and knowledge base? Or should I just settle down a bit? With the recent changes in my life and watching my father turn 80 this year it’s dawned on me that I may be around for a while and want to be able to keep the lights on. Any advice is very appropriate.” Appreciated is probably is what he wanted to say. “Keep up the good work.” All right Jonathan. Yeah. I’m a big fan of Robinhood. I think it’s a really good application. Our buddies, what’s their names from MarketSnacks is now purchased via Robinhood. But I would be careful with, like, trading programs. I think buying ETFs, buying a total U.S. stock market index fund, something like that, S&P 500, total world market fund. You know, that’s where I would start, Jonathan. It sounds like you got the debt under control, and if you want to start savings, I would look at a Roth IRA and pump as much money in there as you possibly can, and I wouldn’t get too fancy here. I would just do something somewhat easy like a total U.S. stock market fund or a World Index Fund and I think you’re good to go. So Jonathan, while you’re listening to Your Money, Your Wealth®, Big Al is listening to earthquake podcasts, and those of you who have listened to YMYW way back since episode #119, when we had Joe Saul-Sehy on the show, may recall that Joe Anderson ’s favorite podcast of all time is Stacking Benjamins. Check the podcast show notes at YourMoneyYourWealth.com for that link, for transcripts of today’s episode, and to see Joe and Big Al’s video response to this next question. To get answers to your questions – and maybe even some questions you didn’t ask – scroll down YourMoneyYourWealth.com, hit the Ask Joe and Al On Air button, and send your question or comment to the fellas as a voice recording or an email. 25:49 – Should I Take My Pension as a Lump Sum or Monthly Annuity Payments? Joe: Nick, from Moreno Valley, California. “I am 54 and plan to retire to the Philippines in January 2020. Total monthly income needed to start is 4000 bucks.” All right. A lot of people going to different places, Al. Al: Yeah, I think that’s cool. Joe: Dominican Republic, we got the Philippines. Al: Where are you going to go? Al: (laughs) He and his Mom. Al: She’s got an extra room in her house doesn’t she? She’s gonna miss the winter in San Diego though. Andi: (laughs) The golf course. Al: You’re gonna go as far away from me as you can. Joe: Yeah. I am, I’m going to somewhere. “I’m 54. I plan to retire to the Philippines in 2020. Total monthly income needed is $4,000. We will have no mortgage when I retire. Currently all will be sold at a gain of $80,000 to pay out of home in Philippines and money left to purchase car and build a vacation home.” Holy buckets! You can pay off your home, buy a car and a build a vacation home for 80 grand. Al: Yeah, I like it. Joe: We will start withdrawing 3% from 401(k) with 3% inflation, or wait two more years and get $2,400 a month from pension and withdraw $4,000 a year from the 401(k) for two years. We will claim Social Security at 65, $3,000 a month.” What’s your question, Nick? “We have $550,000 in 401(k) $120,000 in Roth, $12,000 in an IRA $120,000 in brokerage accounts, $8,000 savings bond, $14,000 in a Philippine mutual fund, $75,000 emergency funds.” Man you’re doing pretty good, Nick. “40/60 split. My question-” Thank God. Here it is. “Is should I do an annuity pension or lump sum?” So let me see. “The total amount after retirement is $380,000 at 55 before -.” Well what’s what’s the pension amount? Does he even give us – how am I going to answer your question Nick when I don’t have the annuity amount? Al: Maybe that’s the 380 if you keep reading. Al: That’s the lump sum, and the pension you already read. It’s $1,900 at age 55, and if he waits two more years it’s $2,400. I think. he could either take the $380,000 or they say, “you know what, we’ll keep the $380,000, we’ll pay you $1,900 a month for the rest of your life.” OK, so that sounds pretty good. The other option is that he’s going to wait two years and say, “I’m gonna take $420,000 versus the $380,000, or I will get $2,400 per month for the rest of my life.” So what Nick needs to do, is he needs to figure out what the internal rate of return is on that cash flow stream. Because then he can compare. Because I would say Al, I don’t know, maybe 10-15 years ago with pension plans, the internal rate of returns were quite high, so it would make zero sense to take the lump sum, because either the government or the employer or whatever, is giving you such a high payment that it would be almost impossible for you to take the lump sum and try to replicate that income stream. And if it’s “guaranteed” by that organization, well you know those are a lot of positives. However, what has happened today is that the amount of payment versus lump sum has slowly gone down. Because A), a lot of these companies can’t afford these pension plans. Before they did some terrible actuarial tables of figuring out they mismanaged. We had 2008, 2000, and all sorts of variety of things. Al: Right, and fixed income has been really low for quite a while. Joe: Right, so it’s like OK, I’m trying to get some income and then my interest rates on my bonds are one or two percent. So we did a little bit of math and the internal – and right now if you run this stuff to life expectancy age 85, I mean, it’s almost a break even. The companies are smart, they get this stuff too. They’re not going to favor one or the other. It’s like, “if you want this we’ll give it to you, if you want that we’ll give it to you.” There’s no really better deal in most cases. The better deal is going to be based on the individual to see how long they live. If they’re going to live a long time, then the annuity payment, that internal rate of return is going to increase. If they die, prematurely of course, then their internal rate of return is going to be a lot lower. And so what did we run, until age 95 with this gentleman? Joe: So let’s say if Nick lives until age 95, so that’s a 40 year life expectancy, his internal rate of return over that 40 years if he took the annuity payment was roughly 5%. So then Nick’s gotta make a decision to say, “well okay, I have a guaranteed fixed income for the rest of my life if that company is still around and that pension is still going to come to me.” So I guess that’s another risk. Al: Yes, well plus it’s a 50 percent survivor. Joe: And if he dies then the wife only gets 50 percent. At 5 percent what would you do, Al? Would you take the annuity or would you take the lump sum? Al: Well, I would probably take the lump sum just to have more control over it I think. Joe: I think so too. At 5? If it was 6 or 7, I would probably take the annuity. Al: Yeah and I think the way that you described is the best in correct way to do it, but a lot of people don’t really know how to do that. Here’s a shortcut, just to give you an idea, is just take the monthly payments, in this case $1,900 multiplied by 12 to get the annual amount. Divide that into the lump sum and see what the distribution rate is. And if it’s 8% or higher, then maybe you might want to consider the payment stream. If it’s 6 percent or lower you might want to consider the lump sum. And it kind of depends, of course, all this is predicated on what your expectation is on life expectancy. And a lot of people tend to like to take the lump sum just because it’s a known thing. We don’t really know how long we’re going to live. And in this particular case, the numbers he gave us was 50 percent survivor, so this could all change if he passes and then his spouse only gets half of it. Joe: Nicf has about, let’s see, five six seven, I don’t know, $800,000 already in liquid assets. He’s only looking to live off of $4,000 bucks – was that a month? And so it’s like OK, well I don’t know, you’re going to have Social Security of a couple thousand dollars. You know, it all depends on life expectancy and control. But I think the internal rate of return on the overall cash flow streams, the net present value, I guess, of what he’s going to receive from cash flows from that pension is decent. So it’s looking at risk at that point. Do I think I can beat 5% over 30-40 years in my portfolio? If I feel that I could do that then maybe you invest it yourself. If you say, you know, what 5% I’m happy with, if I got 5% for the rest my life, then take the pension. Al: Right. And of course now, what if you think you’re going to live to 105? Joe: Yeah, then you absolutely take the pension. Al: Right. Cause it changes then. But we don’t know that, do we? At least most of us. You don’t know how long you’re going to live, do you? 34:23 – What’s a Good Tax-Efficient Mutual Fund to Hold in a Taxable Account? Al: I would say any type of index fund. The problem with the mutual funds is if you get an actively traded fund that has a fund manager that’s buying and selling, trying to beat the market, that causes a lot of taxation. If you get an index type fund, they tend to hold the investments longer term so you don’t have that many buys and sells. So I guess that would be one thing. Another thing to consider is, depending upon the time of year when you’re buying this fund, the funds tend to declare their dividends, their capital gains dividends in mid-December. So you might want to wait until after that happens, because you would get, basically, a dividend for the whole year even though you just invested. So be aware of the timing. 35:11 – Should I Open a Roth IRA and Invest in a Target Date Fund for My Kids’ Future? Al: What do you think of target date funds? Joe: I don’t know, if you’re going to put a couple hundred bucks in it? But I don’t understand – she’s thinking about a target date fund for her kids? Is that what the question states? “My wife is thinking to open a Roth IRA Schwab. She wants to use the money to help our kids in the future.” So why? Okay well you’re 39 years old. How much money do you guys have? I mean, you got a ton and you want to use the Roth IRA for your kids?? That doesn’t make any sense. Don’t do it. (laughs) Don’t do it. That’s my answer. Save for yourself first! Especially in a Roth! You can only put a couple of thousand bucks in the dang thing anyway. All right, Andi I’m sorry about your tragic experience over the weekend and glad that we got that straightened out. For Big Al Clopine, I’m Joe Anderson, the show is called Your Money, Your Wealth®. Thanks a lot for listening. Hey, if you’re into funny outtakes, stick around at the end of this episode for some of The Derails in today’s show. Special thanks to today’s guest, Ashley Patrick of BudgetsMadeEasy.com. Visit the podcast show notes at YourMoneyYourWealth.com for links to Ashley’s 7-day Budget Makeover Course and her Budget Planner for help starting your budget today.